The Best of Cape Cod at New Seabury. Like polished pieces of sea glass found on the beach, New Seabury offers jewels to be discovered. 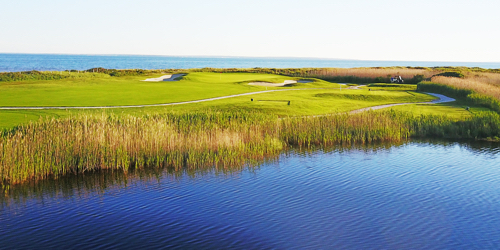 Championship waterfront golf, a 42,000 square foot ocean view country club, a private beach club and coastal nature preserves are just a few of the treasures to be shared with family. Two championship courses await you at New Seabury! Located near the Dunes Golf Course, the Sea Quarters two story condo style units offer spacious accommodations. Each unit has a king size master bedroom, two twin beds in the second bedroom, two full bathrooms, and for additional sleeping, there is a pullout sofa in the living room. The Club at New Seabury reserves the right to change price and offer at anytime. Prices and offer are subject to change without notice. GolfMassachusetts.com is not responsible for errors posted in this golf package. GolfMassachusetts.com is a golf directory featuring golf course directory and golf planning tools. Copyright CityCom Marketing, LLC - GolfMassachusetts.com - All Rights Reserved.